"5 I took care of you in the desert, in a dry land." 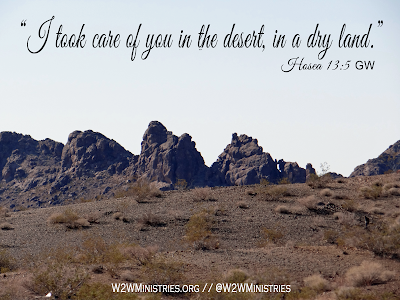 There are times in everyone's life when they go through a time of dryness; when they are in a desert land. It's nothing new. No matter how dry and lonely we feel, there's one thing we can trust. And that's the promise of Hosea 13:5. God is always with us and He will take care of us when we come to the desert. He will be our Living Water to sustain us as we go through. And we will go through!! We won't stay in the desert!! As we go through it, we can trust God to take care of us! All we have to do is rely on Him. We can't sit down and have a pity party. We can't give up. We must put one foot in front of the other. Take it minute by minute if necessary but know that God will take care of you. That's a promise you can take to the bank. Today, if you are in a desert place, turn your eyes on Jesus. Look to Him who loves you more than life itself. Trust that He will lead you through. Get on your knees and seek His face. We are not promised a life of ease as a Christian but we are promised that He will never leave us or forsake us (Deuteronomy 31:6)! !